Featuring my latest food temptations. Bon appetit! Location: Sarrosa Hotel, F. Cabahug St., Kasambagan, Mabolo, Cebu City. Over-all place: Modern Interiors, 30-seater inside, 10-seater outside. Cebu Food Blogger: How do you know a Japanese restaurant is authentic? One indication would be, the head chef is a full-blood Japanese. No one knows better with the cuisine than themselves, the Japanese. I have spoken to the chef himself, a 40-ish from Osaka, Mr. Kazuo Sato. He is well-experienced in making sushis and sashimis way back when he was still 19 years-old. That's a test of time. He also went to the US for some culinary studies and practice. Have you ever wondered why they named it Tsuki? 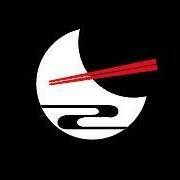 According to one of the owners, Mr. Hiroaki Ishi, it translates to "moon" in English. So let's go the real food story. I'm not a fan of Japanese cuisine myself, but on that day, when I visited Tsuki Japanese Dining, I became a "convert". I'll let you know my favorites! Well, it could be all!